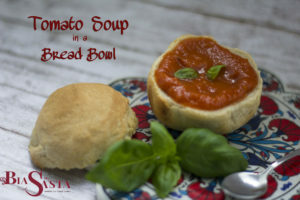 Who doesn’t love a good tomato soup? Did you know that Tomato Soup is the most sold ready-made soup in supermarkets (next to mushroom soup)? One reason could be that most people are deterred by the thought of peeling a pile of tomatoes. 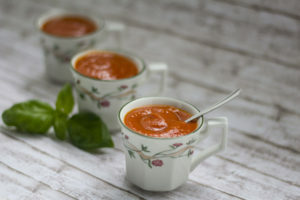 I have made tomato soup for years by roasting tomatoes slowly in the oven with basil and garlic and the result was always a great soup. Tomatoes are best in season – there is no doubt about it. Even better if you can grow them yourself. So, what do you do in winter when you crave this bright red tasty soup? Go to the supermarket? Yes – but rather than buy one of the tubs of soup that includes loads of additives and flavour enhancers choose tomato passata instead. Passata is made from tomatoes that have been minced and sieved to create a smooth tomato sauce. The only other ingredient should be citric acid to prevent mold in the packaging to extend the shelf life. You can add a lot of ingredients now yourself – I always add garlic and basil if I have a plant on the windowsill. Below is the recipe for the soup I made the other day and I was happy with the result. It tasted just like a summer tomato soup – and I had a delicious lunch. I was making bread that morning and decided to use some of the dough to make a bread bowl – just wanted to have something fancy to photograph. A soup bowl or cup works just as fine – it’s the taste you want. In a pot, heat the olive oil over a medium heat and add the onion and carrot and cook until the onions turn translucent (you don’t want them browned). Don’t be tempted to speed the process by using high heat – you want the sweetness of the onion to come out. Add the garlic and fry for about 3 minutes, stirring to avoid the garlic burning. Now add the passata, sugar and stock. Bring to a simmer and cook until the soup thickens slightly – stirring occasionally. Season to taste. Add the basil (ripped into small pieces). If you like your soup smooth, let the soup cool slightly before using a hand blitz or simply enjoy the soup as it. Spoon into warmed bowls, garnish with a basil leave and enjoy with a slice of fresh bread. Serves 2 as lunch portion or 4 as starter in cups.